With the popularity of USB removable media, more and more viruses started to appear that could take advantage of the ease at which these devices can be transferred from machine to machine using plug and play. It was quite easy to rewrite the Autorun.inf file to launch the malware on insertion of the drive because in general it is not write protected. It’s not just on removable drives that the autorun file can be created on though, it can be burned to a CD/DVD and also created on local hard drives including the system drives. An autorun.inf file at the root of your local drives can be problematic because when you open My Computer and try to access a drive, it could run a virus to infect your computer. Quite often antivirus software doesn’t touch autorun.inf because it’s only an instruction file that tells Windows what to automatically run when you access the drive from My Computer, not the malicious file itself. So even after the virus has been cleaned, you might find that you’re unable to access your C drive because autorun is pointing to the removed virus. A search window could appear, a script/file might try to to run or when double clicking your drive, it gives you an option to choose a program to open instead. While this issue is greatly reduced these days because Windows Vista and above won’t process the Autorun.inf file on any devices apart from CD-ROM drive types, it’s possible to still get this problem on XP, especially if the system isn’t fully patched. Usually the autorun.inf cannot be easily deleted because it has protected attributes, although expert users would have no trouble bypassing this. This procedure might be tougher for a normal user. Here’s 3 tools to easily delete the autorun file restoring the double clicking a drive option in My Computer. Disk Heal is a useful tool that restores the condition of your storage device after being infected by a virus. Although it’s not in development any more, Disk Heal is a useful tool that performs many functions, most of which are quite useful. While there are loads of tweaks you can apply to different areas of your system such as Control Panel, Internet Explorer, Appearance and Security, the Fix section is what makes the program more valuable to the user. 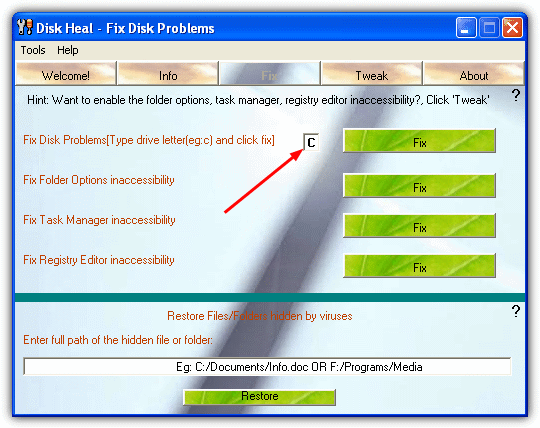 After installing and running Disk Heal, click on the Fix tab. In addition to being able to sort out the drive problem, it can also fix Folder options, Task Manager and Regedit being inaccessible after a virus infection. The option to fix the drive is at the top, and you simply enter the letter of the drive which has the problem into the small box and press the Fix button. If any other drives have a similar issue, repeat the process. Disk Heal doesn’t actually delete the Autorun.inf file itself but blanks its contents rendering the autorun function ineffective. A reboot or logoff will be required to complete the process. There’s also another useful cleanup function at the bottom to restore hidden files and folders that have been hidden by a virus and they can’t be seen. Disk Heal is a standalone executable so can be copied from the Program Files folder to make it portable. If Disk Heal has functions you have no interest in and simply want to sort the problem of your drive not opening in My Computer, then FixDrive is what you want. The program is small (60KB) and portable so requires no installation. It is described by the developer as a tool to fix the issue of Network drives not opening when you double click on them, but the same principle applies to other drives such as C.
FixDrive couldn’t be much easier to use, extract from the zip file and then run it, select the drive you want to repair from the selection box and click Fix. If there is an Autorun.inf present on the drive in question, it will be deleted completely. After a logoff or reboot, you should be able to open the drive on double click again. This tool is developed by sUBs who also created the ComboFix malware removal program. It’s slightly different to the other tools above because it also has a limited ability to remove some autorun viruses while they are still attached to the inf file. In addition to USB flash drives, Flash Disinfector can remove the autorun file leftover from viruses on local system drives that are causing the folder to not open in My Computer. 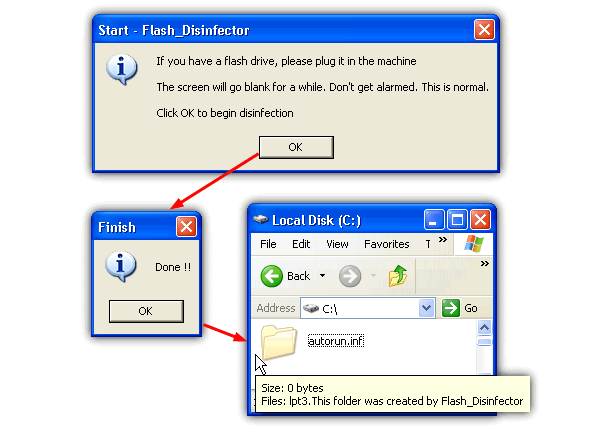 It’s very easy to use, just run Flash_Disinfector.exe and it will tell you to plug in your flash drive that is infected by malware. If you want to repair a fixed drive, just press the button to start. The screen will then go blank for a few seconds, then you’ll see a popup window saying “Done!!”. Once completed, all autorun files will be gone from your drives and replaced with a protected folder called Autorun.inf, this is quite normal and a preventative measure to stop future autorun virus issues. Press Y to confirm delete and the folder along with the dummy file will be removed. Obviously substitute C:\ for any drive letter you wish. The two commands above can also be used to delete the original autorun.inf manually if you have any problems with the listed tools for any reason. Even though this problem is mostly related to the leftover Autorun.inf file, there is another way your drives in My Computer can be stopped from opening. A few incorrect settings in the Windows registry can also open other windows such as search or programs on double click similar to the Autorun issue. Windows Vista, 7 and 8 can all be affected as well as XP because similar registry keys are present in all versions of Windows. Re Registering the shell32.dll file resets a number of Windows shell functions that can possibly become corrupted causing various issues, including opening drives in My Computer. in my windows xp, when i am double clicking on ‘local disk C’,it is saying “hello world” caption and not opening. please give me the solution on my gmail account which is given. I have to say, every time I come to raymond.cc there is another remarkable article up to read. One of my friends was talking to me about this topic a couple weeks ago. I think I’ll send my friend the link here and see what they say. i tried the disk heal on my Desktop, worked. EVEN when i already copied the “tabctl32.ocx, comdlg32.ocx” to “C:/windows/system32″. Any help will be very appreciated…..
Million thanks…… Raymond. Finally this disk heals my wounds…. Hats off!!! God bless u….. Muaaahhhhhhh!!! i downloaded it from here tho..
Will Diskheal or Flash Disinfector delete everything in my flashdrive or the files in my comupter? Thanks a ton, this has really helped me. Modifying the registry can cause serious problems that may require you to reinstall your operating system. We cannot guarantee that problems resulting from modifications to the registry can be solved. Use the information provided at your own risk. The first and easiest way to hide all the drives in My Computer is via a policy. If you don’t understand how to use policies you should review Microsoft’s Guide to Policies and Profiles. After locking the drive when u try to open it, u will see a msgbox like this”This operation has been cancelled due to restrictions in effect on this computer. Please contact your system administrator”. I am not able to assess any of my drives (partitioned in C,D,E and F). windows xp is working fine. I am able to open all the files of desktop but none of the folders of desktop are getting open? This operation has been canceled due to restrictions in effect on this computer. Please contact your system administrator. Kindly look in to the matter and advice me. i will be highly thankful to you. Hi! Can you please tell me how to cleaned the above mentioned virus (C:\WINDOWS\system32\ieso0.dll) as if it is can’t been deleted by ESET Anti-Virus. Thank you sou much! Hi! Can you please tell me how to cleaned the above mentioned virus as if it is can’t been deleted by ESET Anti-Virus. Thank you sou much! This was driving me crazy, dl’d the disk heal app, did the job. I thought I was in the clear when I deleted all traces of virus with avast antivirus… untill I found that i could no longer open my local drives with the a simple double click, Disk heal was the icing on the “sweet – my pc works again” cake. i locked my drives with easy drive lock software,after some time,i tried to open my d,e,f drive those were not opening,i tried to unlock with those passwords,but it is not working.how can i open my drives.i dont want to loose my data. plzzzz help me urgent……………. before this i used to format my all drives which takes time and also i used to lose many of my important files. One of my 3 parts of my computer didn’t work when I was trying to access in my computer in the usual 2 clicks. I just opened the Disc Cure and add the letter drive I had problem and ordered to fix the current drive. It works fine after boot the system. Thank you for all. Thanks a lot for the flash disinfector. c drive in my pc is opening but other drives are opening with program archive, this has happen when i connected my pen drive and copied a folder from it while it also had a autorun.exe file in it which runs the drives to open through autorun program. but as i deleted it from ny removable disk , so thid has affect other drives and can not locate that file. help me to run my drives as normal to open directly. T H A N K Y O U V E R Y M U C H! Thanks for posting and disk heal is the biz and it worked so fast. There\’s another way to create an unaccessible empty Autorun.inf so double-click on any removable drive won\’t open anything. This may stops accidentally opening the virus executable. Origin from \”bbs.et8.net/bbs/showthread.php?t=929213%E3%80%82\” (in simplified Chinese). It works on FAT/FAT16/FAT32. Just change the normal file attribute from Archive (0x20) to Device (0x40) or set the file attribute bit6. To do so, create an empty \”AUTORUN.INF\” at the root of the removable drive and make sure the filename in upper case. Run Tiny Hexer or WinHex to search the whole drive image for exact \”AUTORUN INF \” (two spaces within). The filename should start at the biginning of a 32-byte boundary and these 32 bytes should end with 6 zeros. Replace \”AUTORUN INF \” with \”\”AUTORUN INF@\” and save. Eject the removable drive and insert again. Check to see if you can read, rename or delete AUTORUN.INF. Perfect solution solved my problem perfectly perfectly. We would like to thank Raymond, the author of this blog for buzzing about our product Disk Heal, Thank You! We wish you more success in this already successful blog. Thank you bro! its great software Disk Heal.. after seconds… my drive c will open fine.. .. Thank u Very Much this tool is very helpful at any given point of time………………………………………. what a great posting raymond. Keep trying, sure you can be a great person someday. when i double click on my local drive d \\\\\\\\ the message is showing . choose the program open with. when i double click on my network drive the message is showing recycler\\\\desktop.exe file not found make sure the file name and path are correct.i format the pc but the problem is same please help. my system is error any time shome error C Drive is full when only install windows XP, some softwar, dont show hidden file and temp file, what is this Error and breaff me this problem i am wating for any person….? thx to you. im going to fwd this blog in my blog. thanks i help me a lot,b4 this to solve this problem.i restore my pc.and back to normal.but i have a fast way. thnaks very much for \”disk heal\” it is really helpful. I used this tool due to a virus infection which has really made my day. It is called W32.gammima.AG which has cased lots of corruption in my laptop although it is rated as a “LOW RISK” in Symantic website. I ran the anti virus and Cleaned/Deleted the infected file but the problem of not getting the drive “C” opened. Thanks for this tool. Hey man. Thanks a lot for the post. It solved my issue of “Computer drives not opening on double click”. This tool is really cool. i am avinash…….i have installed Folder Vault software in my system……wen i use it i locked my drive D:\ and after sometime…..wen i unlocked it …i used to double click my drive D:\ and its not opening……..it shows some error…..like”””D:\ refers to a location that is unavailable. It could be on a hard drive on this computer, or on a network.Check to make sure that the disk is properly inserted,or that you are connected to internet or your network and then try again.If it still not be loacted,the information might have been moved to a different location.””……………Please solve my problem…….i dont want format that drive……..bcoz i have important data on drive D: …NOTE:my drive d contains only data and no program files or windows files……..please solve my problem please…………i want to get back my drive………please……..is there any solution…….please….. If u can/know how use dual-booting. In Ubuntu you can access your hard drive and delete the autorun.inf file. If you want u can also run an antivirus for linux like avast! I really appreciate ur efforts to help people out. God bless the internet! Thanks for the shareware Flash Disinfector it really works. I tried many well known antivirus but it doen’t fix my drive virus. Now I don’t need to reformat my C: and I save my other program licenses. i accendentally install a crack.exe but iam able to see my local disk but my real problem is my desktop taskbar and icon is kind of refreshing in about 2 sec. thats why i cant entirely see whats inside my local drive and cant erase the .inf is this tool can help me??? Sohail, that’s because you still have virus in your computer. Try going to forum and get help there. When I click on “show hidden files” under folder option and click OK then I reopen folder option, I find option changed to “don’t show hidden files” automatically. I think something is preventing the settings to be saved. I have cleaned my system with Kaspersky and used Hijackthis etc. but still the same problem. Will anyone help me to solve this problem please? Thanks for this Raymond, Disk heal is surely an amazing tool. ..Downloading it right away!